The fort lies close to the edge of the southern shore and was quite a small fort covering only 2 acres. It started out as a turf fort attached to the Turf Wall but was later rebuilt of stone but built smaller this time round. Excavations were carried out here in 1899 and 1947. Above the door at Hesket House, formerly known as the ‘Steam Packet Hotel’, there is a fragment of an alter which has the following inscription ‘MATRIBUS SVIS MILIT(S)’, a dedication to the Deae Matres by a contingent of soldiers. 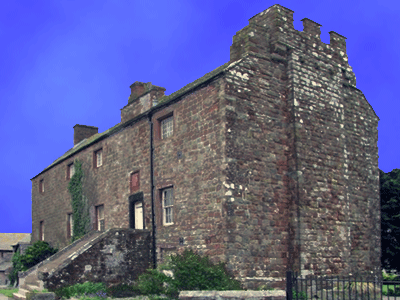 Hesket House is in Port Carlisle. Part of the Wall nearby stood to a fairly decent height until the nineteenth century when it was robbed away unfortunately. The actual fort remains were robbed away much earlier as Leland discovered when visiting the fort in 1539. The nearby Manor House is built almost entirely of Roman stone. He states ‘..at Drumbuygh the Lord Dakers father builded upon old ruines a pretty pyle for defens of the contery... The stones of the Pict Wal were pulled down to build Drumbuygh. For the Wal ys very nere yt?’. 1st_Note The history of this fort is uncertain; no unit is attested there by an inscription and the Notitia entry for Congavata normally associated with it may in fact refer to another fort.